Use this function to calculate the Euclidean distance or to simplify expressions involving length. To enter //x//, tap the absolute value key twice. To enter data points, use brackets and separate arguments using a space. Enter one expression per line. Tap the absolute value key |x| twice to enter a vector ||v|| as "norm." Leave a space between arguments and enter the vector expression in brackets [ ]. 1) Enter the expression: ||2 6 9||. It should appear as: "norm[2 6 9]." When you use the vector key ||v|| it will appear as "norm." 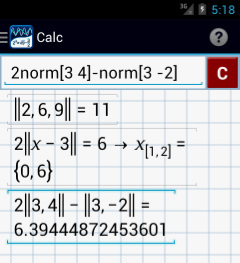 2) Enter 2||x - 3|| = 6 by typing "2norm[x - 3]." 3) Enter 2||3 4|| - ||3 -2|| by typing "2norm[3 4] - norm[3 -2]. Tap the /x/ key three times to find the determinant of a given matrix. Enter the arguments by row with each row in brackets and separate elements with a space. Note: the result will always be 0 for non-square matrices. Find the determinant of each matrix below. Enter one matrix per line. Note: tap ( or ) twice to use brackets [ or ]. 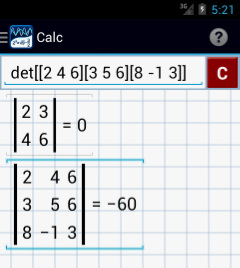 Tap the absolute value key |x| three times to use "det." Tap the /x/ key four times to use this function. The trace of a square matrix is the sum of its diagonal elements. Find the trace of each square matrix below. Note: tap ( or ) twice to use brackets [ or ]. Tap the absolute value key |x| four times to use "tr." Tap the /x/ key five times to use the adjugate function. The adjugate of a matrix can be found by replacing each element by its cofactor. Find the adjugate of each matrix below. Note: tap ( or ) twice to use brackets [ or ]. Tap the absolute value key |x| five times to use "adj." 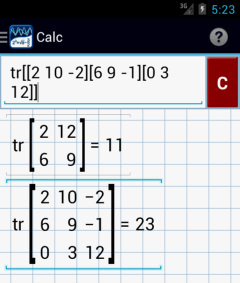 Tap the /x/ key six times to find the transpose of a matrix, ^T. In a transpose of a matrix, the rows are the columns of the original and the columns are the rows of the original. This function also converts vectors into one-column matrices. Find the transpose of each matrix below.